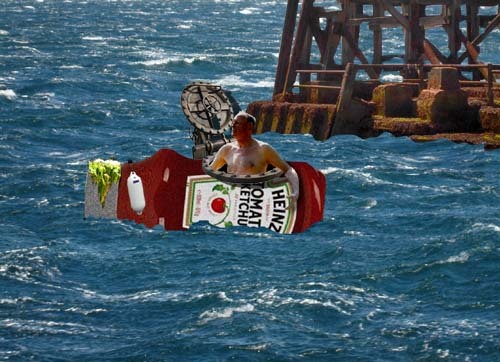 A 72 year old retired accountant from Sussex this morning set off to cross the Atlantic from Shoreham harbour in a plastic Heinz ketchup bottle. Malcolm Selvedge has spent the past five years building the vessel from a promotional display stand he found on eBay. The unpowered ‘boatle’, as he calls it, is fitted with a kitchenette, a single bunk, flushing toilet and electronic navigation equipment. Mr Selvedge will be towed by a cargo ship to the Portuguese coast where he hopes to pick up the Easterly Trade Winds that should eventually deliver him to a Caribbean island, ‘preferably Antigua’ he says. Funding for the trip, which has never been attempted in any form of sauce bottle, has come from Mr Selvedge’s wife Audrey who, on learning that he would be away for at least four months, immediately paid for the whole project.